Easily see the moons of Jupiter in addition to clear images of Earth’s moon, and the other planets. 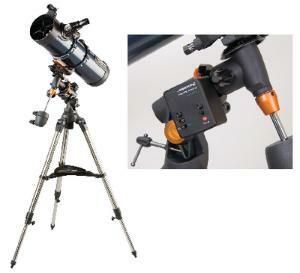 This AstroMaster telescope features all coated glass optics for clear, crisp images, and a German equatorial mount with setting circles makes it simple to accurately locate and track sky objects. A StarPointer is permanently mounted on the telescope, and a motor drive offers automatic tracking — two features ideal for aspiring astronomers. Ideal for terrestrial and astronomical use, its dovetail attachment design does not require any tools to set up. Includes a deluxe accessory tray and The Sky-Level 1 software with 10,000 object database.